Professional cleaning of soles, sole edges and the top of the shoe. With special brush for simultaneous cleaning of soles and sole edges. Integrated injector for dosing detergents and disinfectants. Available for wall or floor mounting (see options). Made of high-quality, finely polished stainless steel. The sole cleaning machine 100-024 is a professional sole cleaning machine for companies in the food industry and the catering industry. Due to its compact dimensions, the machine is ideal for smaller companies in the hygiene sector as well as for securing side entrances in larger production companies. The sole cleaning system is completely made of stainless steel (1.4301) and can be supplied either as a stand-alone version or for wall mounting. Quick and efficient cleaning of soles, sole edges and upper. With special roller brush with plate brushes for simultaneous sole and sole edge cleaning. The top of the shoe can be cleaned with the same brush. Very high quality nylon bristle boarder of the special brush. Suitable for work shoes, boots and clogs. Fine dosing of the cleaning agent is possible (injector). Integrated canister holder for storing the cleaning agent. Handle bar with contact button for starting the machine. Available for wall mounting or as a free-standing version (see options). Can be connected to a normal socket thanks to 230V connection. Construction according to EU hygiene regulations. Image: Sole washer 100-024 wall or floor mounting with 230V electric supply. The employee must press the contact button on the handlebar to start the sole washer. This starts the rotation of the special brush. The boot, clog or work shoe can then be rubbed in the roller brush and the side plate brushes. During this process, the footwear and brushes are continuously sprayed with water and cleaning agent. The detergent is dosed automatically by an individually adjustable injector. Changing the dosing nozzle changes the mixture of water and detergent/disinfectant. Due to the combination of mechanical abrasion and the water-cleaning agent mixture, even stubborn dirt is simply washed off the soles and sole edges. Thanks to the large space under the roller brush, the top of the shoe can be cleaned with the same brush. The foot can simply be held against the underside of the brush. The used liquid is collected under the brush and automatically drained off together with the grated dirt. The sole cleaning machine is completely made of fine polished stainless steel (1.4031) and is characterised by great robustness and a long-lasting service life. The boot cleaner is available as a standing version or as a version for wall mounting (see options). In the standing version, the system is equipped with a robust and stable base made of stainless steel. The model for wall mounting is already prepared for installation. Thanks to existing holes, the sole cleaning machine can be quickly and easily screwed to the wall. 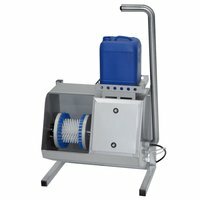 The sole cleaning machine is ready for connection, but siphon, sealing and small parts as well as the blue canister are not included in the package. Commissioning is extremely simple: the sole cleaning machine simply has to be connected to a fresh water pipe, a drain and a standard socket.